Radiant your Skin Care with the [A.H.C] Premium Hydra Gold Foil Mask 25g x 5! we aim to provide you best korean products to take good care of your skin, including Cosmetics, Skincare, Mask Sheet. Hydra Mask Sheet online. Prestige Sheet Mask that gives highly enriched moisture to your skin. 4. Essence that offers 2 effects(brightening, anti-wrinkle) at once. Step 1. After washing face, tone your face with toner. Step 2. 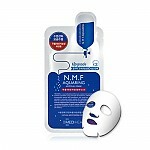 Open up the package and cover all over your face tightly with the mask sheet. Step 3. Leave the mask sheet for about 10-20 minutes to let nutrition fully absorbed into skin. Step 4. Remove the mask sheet from face. Tap lightly your face to let left-over essence absorbed into skin. Sodium Hyaluronate, Panthenol, Vitamin B5, Hydrolyzed Collagen, Colloidal Gold, Panax Ginseng Root Extract, etc. tin…@yahoo.com This mask is very hydrating & you can see the result after one use!!!!! This mask is super hydrating, comparing to the blue one.